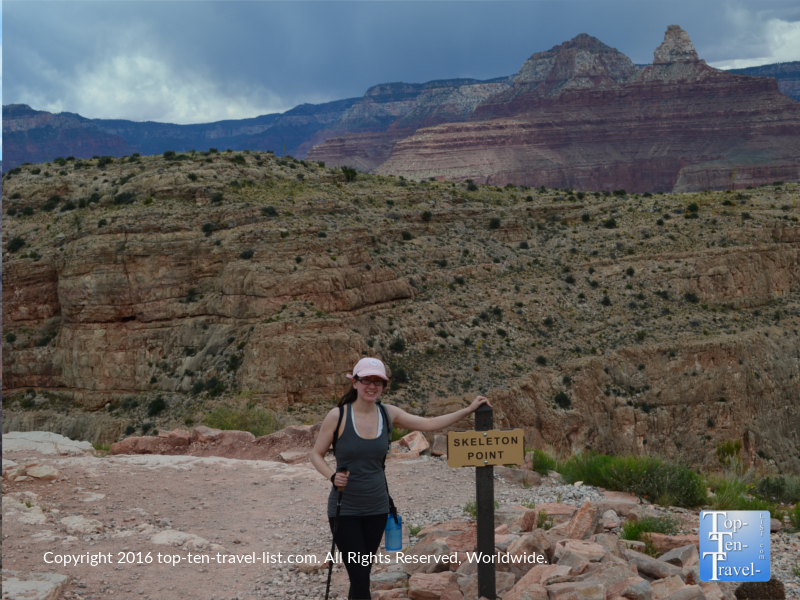 Hiking the Grand Canyon: The Kalibab Trail to Skeleton Point - Top Ten Travel Blog | Our experiences traveling throughout the US. 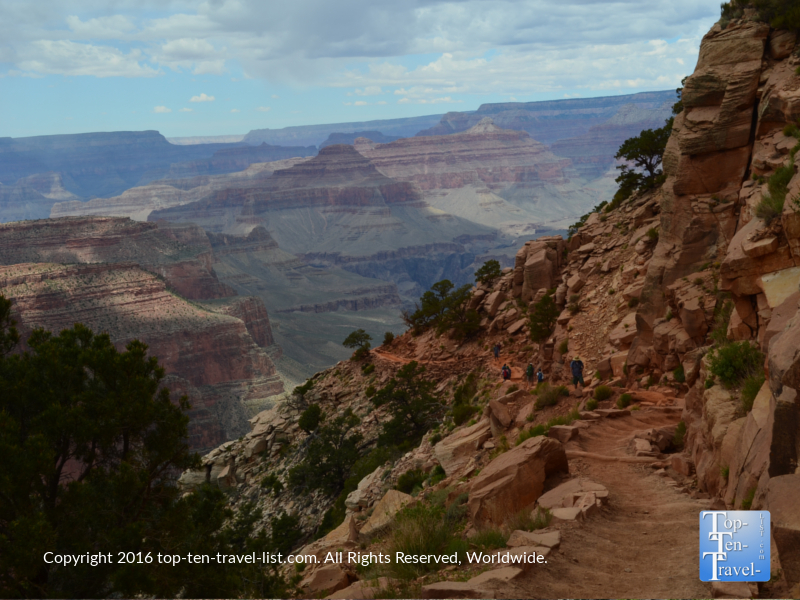 A hiking adventure through the Grand Canyon will be one of the most memorable experiences you will ever have on a national park vacation, if not any vacation. 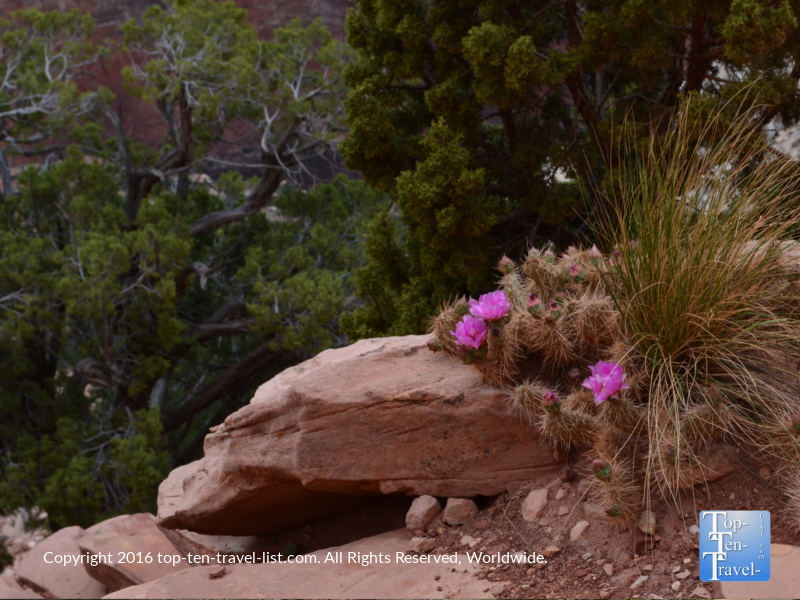 Many visitors are unaware that there are several maintained hiking trails which will take you on a quiet scenic journey through the inner canyon, most of which are short enough to incorporate into a day trip. When you are unable to plan a overnight hiking trip all the way down to the river, a day hike is your next best option. 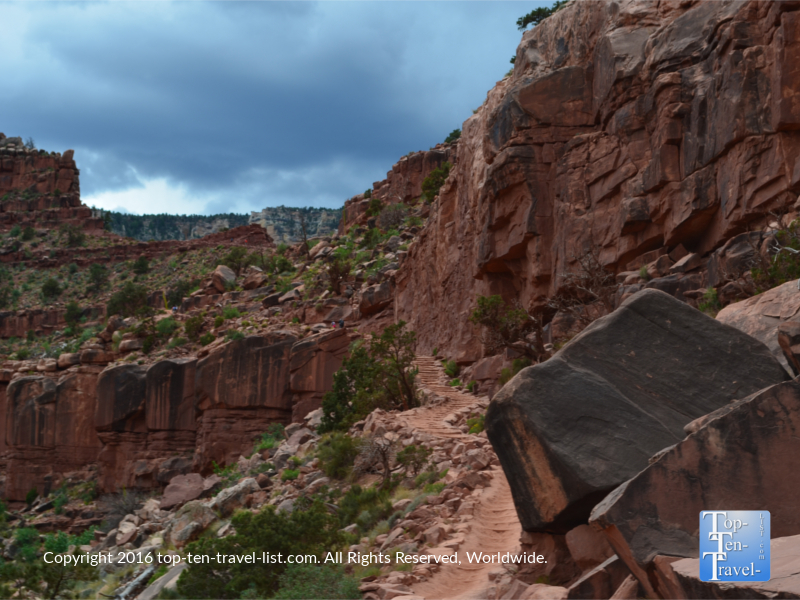 Aside from the popular Rim Trail, a 13 mile maintained path which gives visitors a convenient means to stroll along (or shuttle along) to various points of interest & scenic overlooks, you will find 2 more adventurous hiking options: the South Kalibab and the Bright Angel Trail. Both of these wonderful hikes have varying stopping points, making them fantastic options for hikers of all abilities. 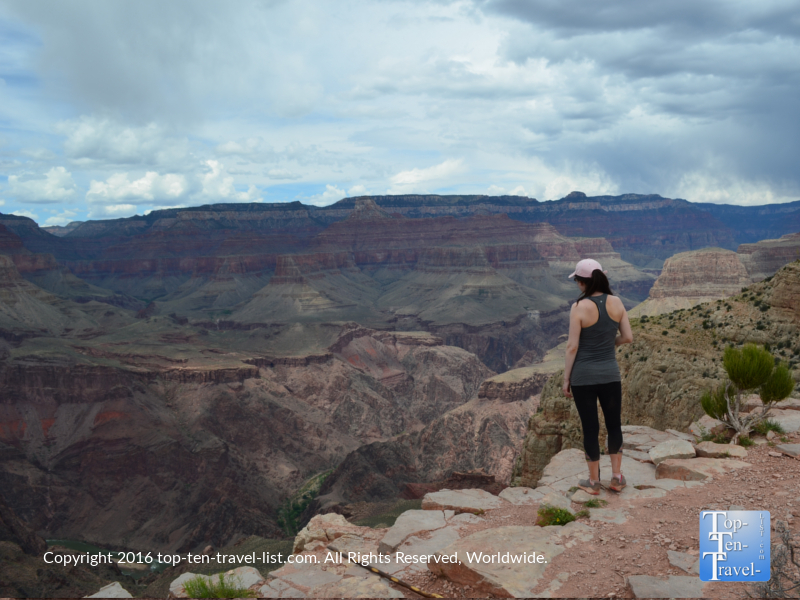 They are much quieter and more scenic than the Rim Trail, with the added advantage of offering more incredible views that you would see from a simple overlook. There really is no better way to explore America’s natural wonder than embarking on a beautiful hike. 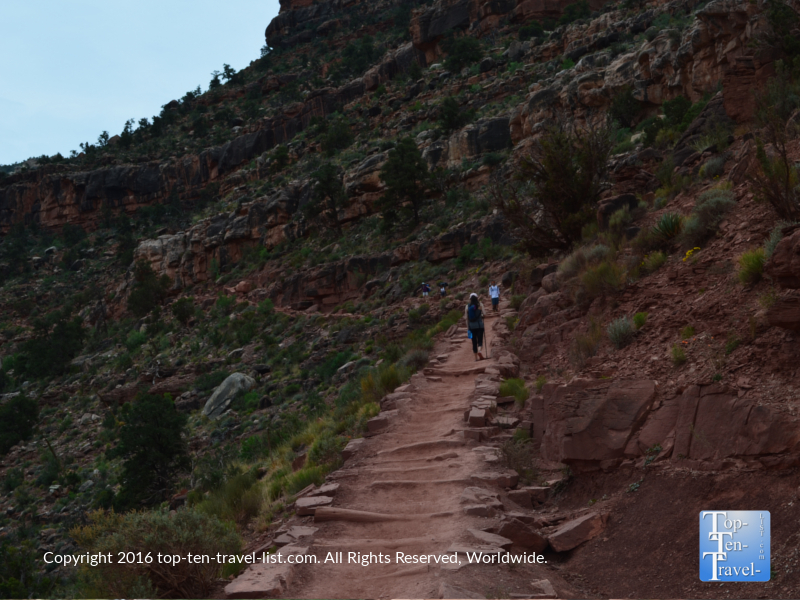 With 3 stopping points (Ooh-Aah Point, Cedar Ridge, & Skeleton Point), the South Kalibab Trail is an option for any nature & fitness enthusiast visiting the Grand Canyon. The trail basically goes downhill for the first 3 miles out to Skeleton, followed by a very steep 3 mile uphill climb on the way back. It can almost seem too easy going down & you may be tempted to go further than your comfort level, but just remember, what goes down, must go up! Don’t let the easy downhill portion fool you – if you are not in good shape, keep your hike simple and just go out to the 1st turnaround point (Ooh-Aah) which still offers some really stunning panoramas of the area. For regular hikers and fitness buffs who would consider themselves in great shape, I recommend completing the entire hike to Skeleton Point (not recommended as a summer hike due to the heat). This 6 mile, half day adventure is tough (even for a half marathon runner and regular weekend hiker like myself), yet a very rewarding experience due to the peacefulness and breathtaking views. After the 1st turn around point, the traffic really dies down and you feel as if you have the entire canyon to yourself. In fact, we saw no more than 10 hikers total after Cedar Ridge! Cedar Ridge is the halfway mark and here you will find a bathroom. Additionally, you can soak up the nice scenery for a bit and refuel with some quick snacks. The 3 mile journey to Skeleton Point is overall pretty relaxing with nice views and an easy downhill trek. I recommend a hiking stick for better traction in some of the steeper, looser gravel sections. Take your time so you do not slip. We were lucky enough to get a hike in just before a freak storm, so we got to enjoy some incredible stormy scenery The cooler temperatures & overcast skies made the hike a little more tolerable, especially when going uphill. 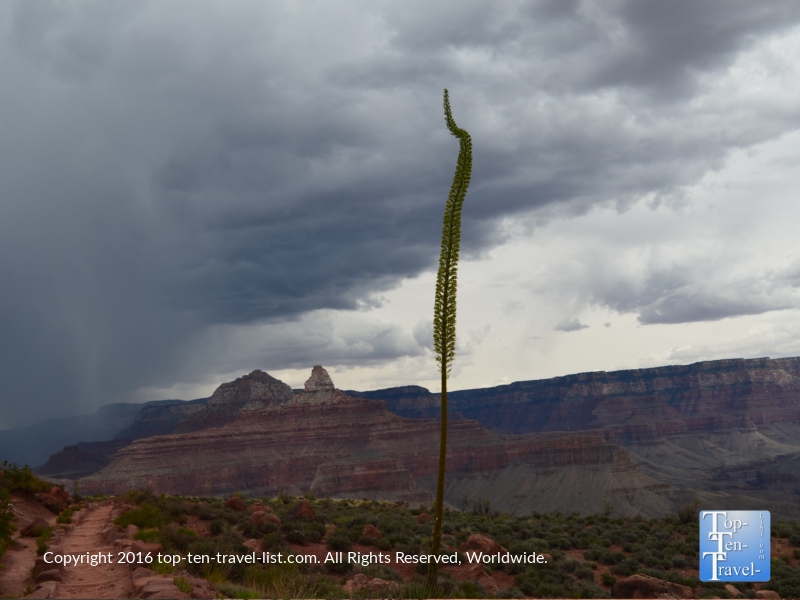 Be prepared for random weather changes at any point, especially during summer monsoon season! 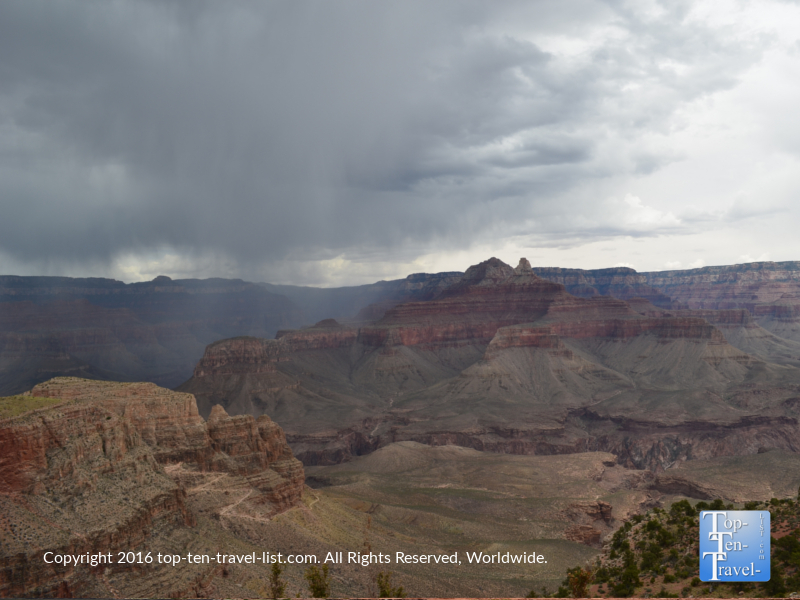 Take a look at these gorgeous views right before an afternoon thunderstorm. Upon reaching Skeleton Point, you will be treated to serene views of the river. Most times, there will not be a single person in sight so you can take some great photos and enjoy the views all to yourself! Be proud that you are one of the few people able to see this stunning river view, thanks in part to your hard effort! Relax for a bit – you will need it before embarking on the incredibly challenging 3 mile uphill climb. Seriously, there is not a single break going up – you will be walking uphill for the next 3 miles! Take lots of water breaks, replenish electrolytes with drinks or snacks, and take it easy, keeping in mind you are in a high altitude area where the air is thinner (meaning less oxygen is available). Even those in the best of shape need to take in easy in high elevation areas. If time permits, get used to the change in altitude for a few days before doing any strenuous activity like this hike. After your hike, you will surely agree that you got in a fantastic full body workout for the day. In fact, you will likely be too sore the next few days to do much of anything. Nevertheless, the trek is worth it for the outstanding views and once in a lifetime opportunity to explore the canyon in such a serene setting. Too many visitors come and go without even knowing that these wonderful trails exist. Completing even a short section of one of these trails is really recommended for the tremendous photo opportunities and opportunity to explore one of nature’s greatest creations in such a desolate setting. 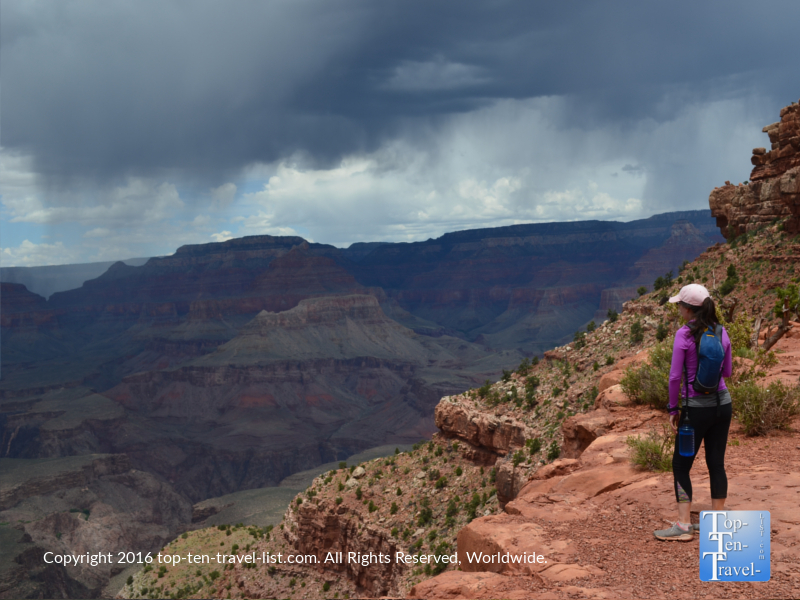 While taking pics from a few overlooks along the rim trail still makes for a worthwhile canyon trip, nothing compares to an adventurous hike inside the canyon. 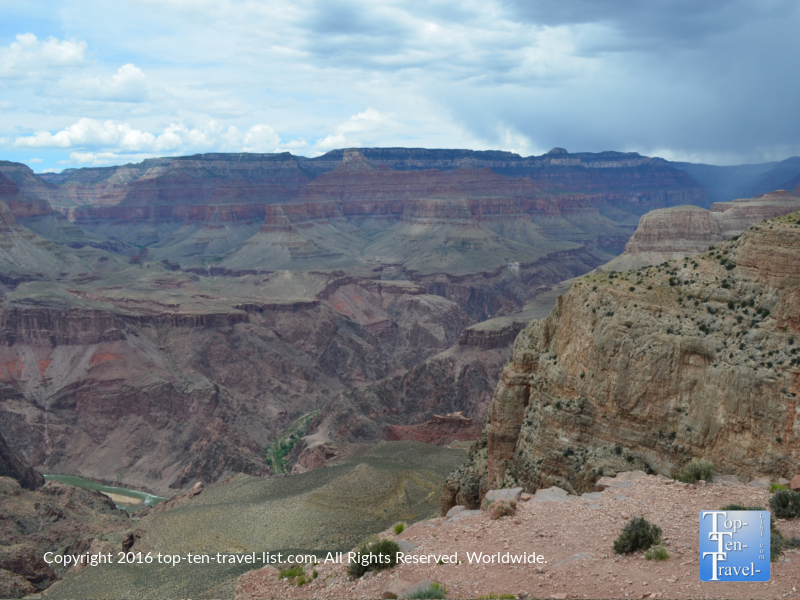 Out of the trails available at the Grand Canyon, the Kalibab Trail offers the nicest views in the shortest distance. 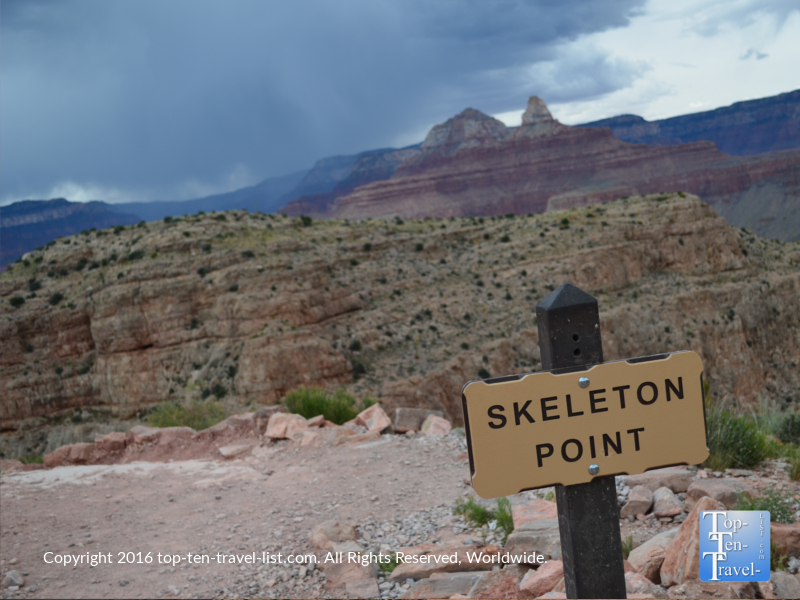 How long will it take to hike to Skeleton Point? 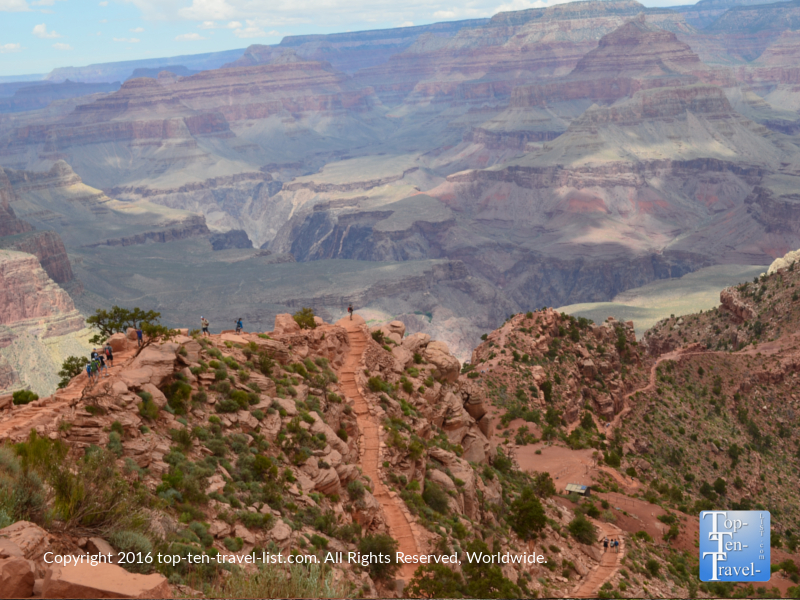 The park estimates that it will take the average hiker about 3-5 hours to complete the entire trail. For 2 regular hikers in good shape, with several rest & photography breaks, it took us about 2 hours. Plan more or less time depending on your current activity level & overall fitness ability. Plan twice as long going up as it took to go down due to steep staircases like the one shown below. On an interesting side note, Skeleton Point is named as so, not for the high number of human deaths along the trail, but rather for the number of mules that have died. One would think there would be at least a few falling casualties due to the steep drops off along the trail, however, no one has fallen off the edge. 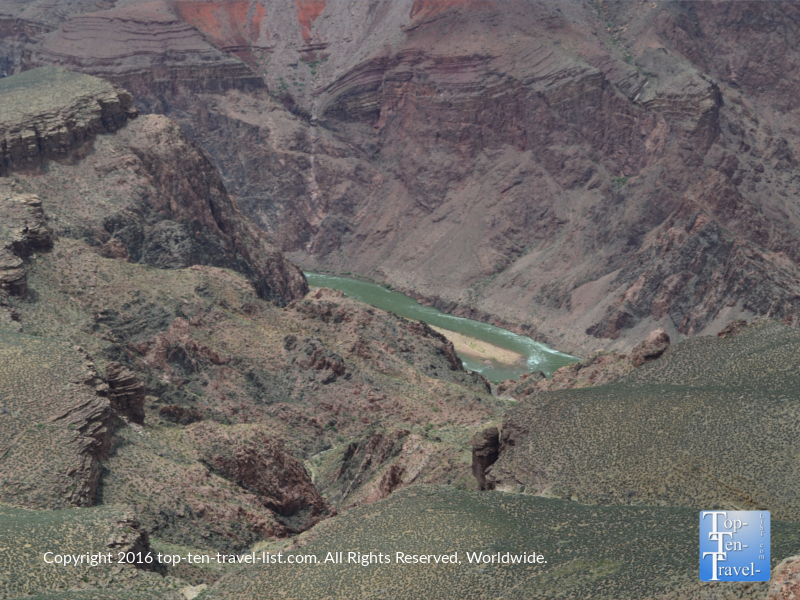 Interestingly, most deaths and injuries on the Kalibab trail and elsewhere at the Canyon are due to dehydration, overexertion, mule related collisions, and lightning strikes – all things which could be avoided with proper planning & preparation. For a really interesting read, pick up a copy of Over the Edge: Death at the Grand Canyon, available in various gift shops or through Amazon. When you see a mule on the trail (and you will likely see several tour groups as they share the same trail as hikers), be sure to get out of the way in advance by moving as far to the side as possible and staying put until they are out of sight. A mule ride is another interesting way to explore the great scenery along the Kalibab trail, although much pricier. For a budget friendly and more rewarding experience, plan on doing the hike. 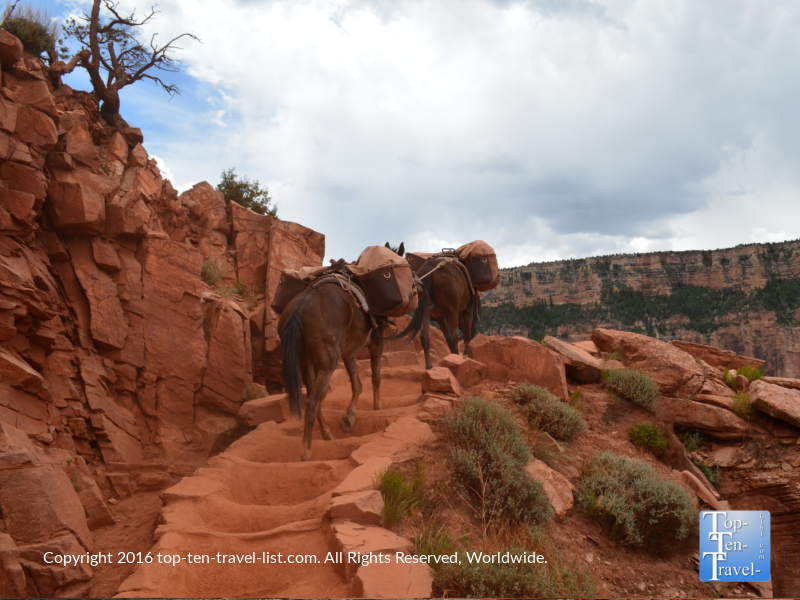 Even though mules are sure footed and there have been no hiker deaths from mule rides, I would advise those scared of heights and very steep drop offs to pass on the mule ride. 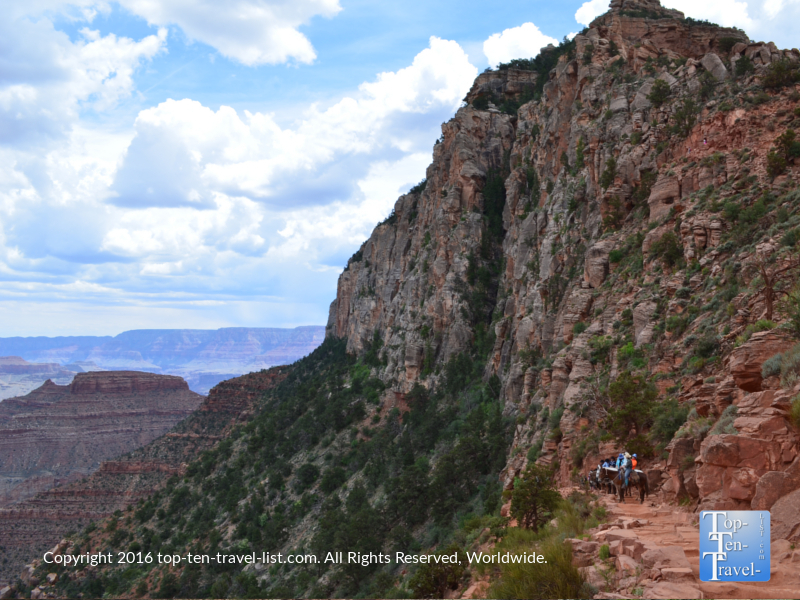 Hike or mule ride, exploring the gorgeous Kalibab trail is a must on any Grand Canyon vacation: by far one of the most breathtaking ways to explore one of America’s great wonders! 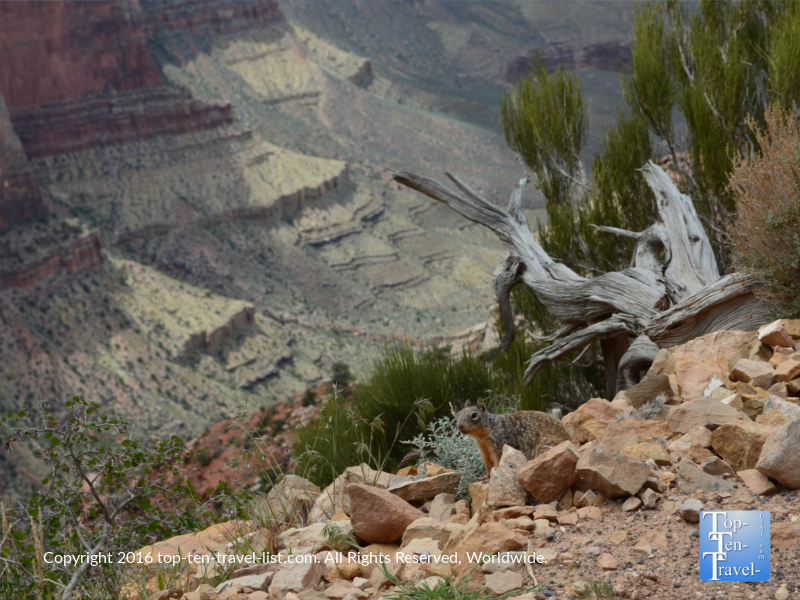 Many mammals call the Grand Canyon home including bighorn sheep, mountain lions, deer, and elk. Sightings are rare. Keep a safe distance from all wildlife. 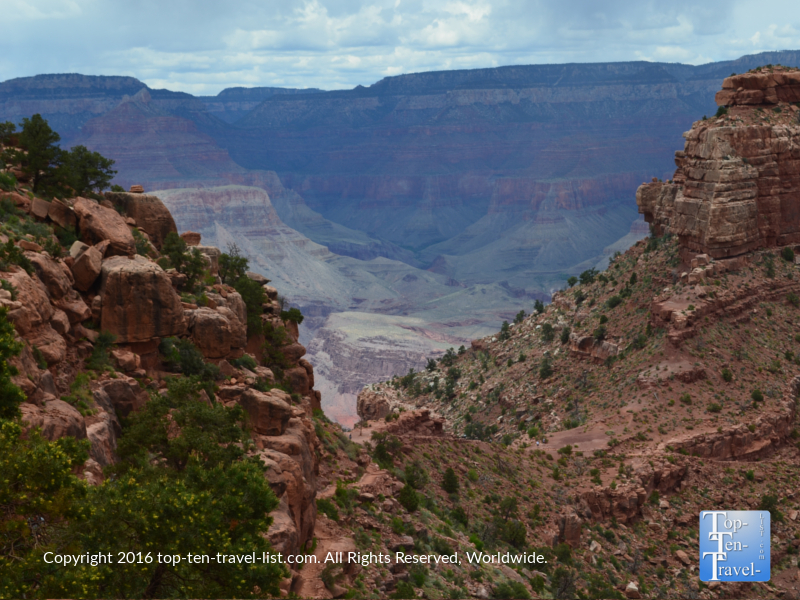 The South and North Rim are both home to a diverse variety of plant life due to the drastic change in elevation from the river to the North Rim. 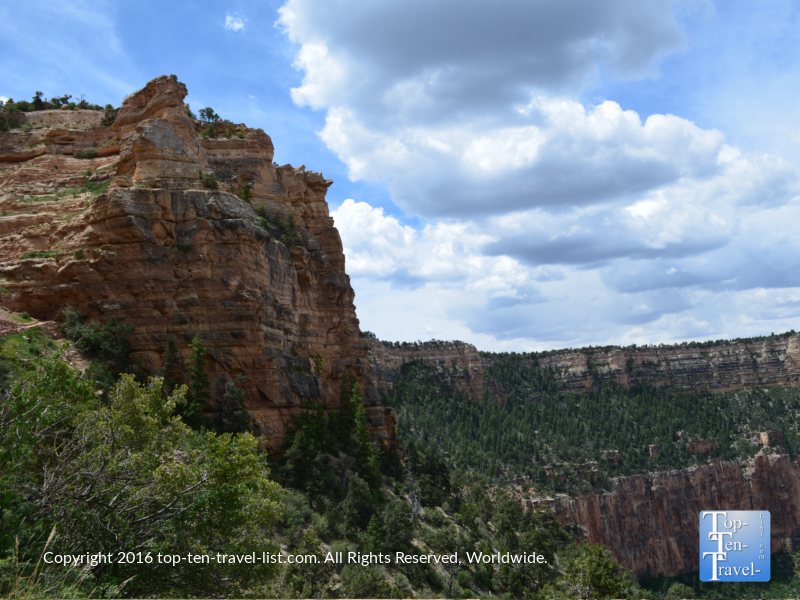 You will find just about everything including desert scrub, riparian, pinyon pine and juniper woodland, ponderosa pine, and Montane meadows and subalpine grassland communities (North Rim only). 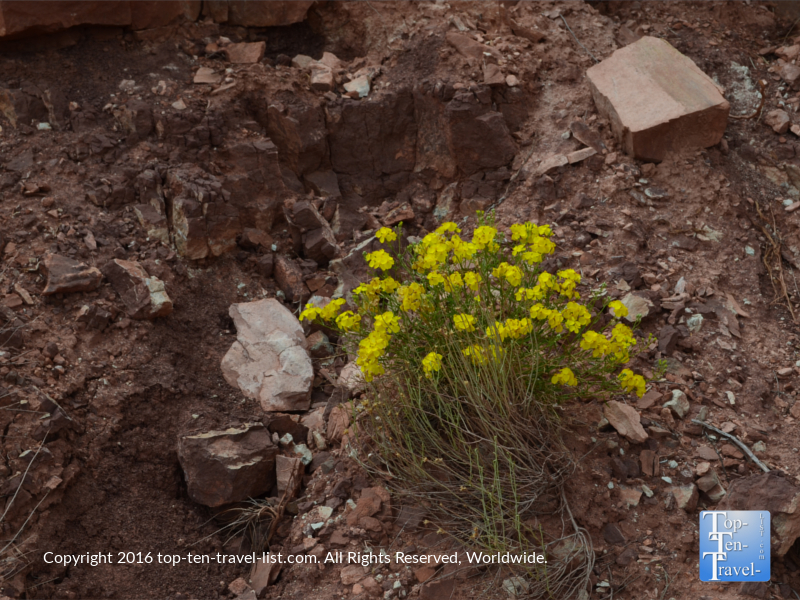 Also be on the lookout for gorgeous wildflowers, of which the Canyon is home to over 650. Most hikers underestimate the intensity of these desert, high altitude hikes, especially when combined with extremely hot and dry summer conditions. Here are a few tips to keep in mind for a smooth visit. *Start your hike as early in the morning as possible. 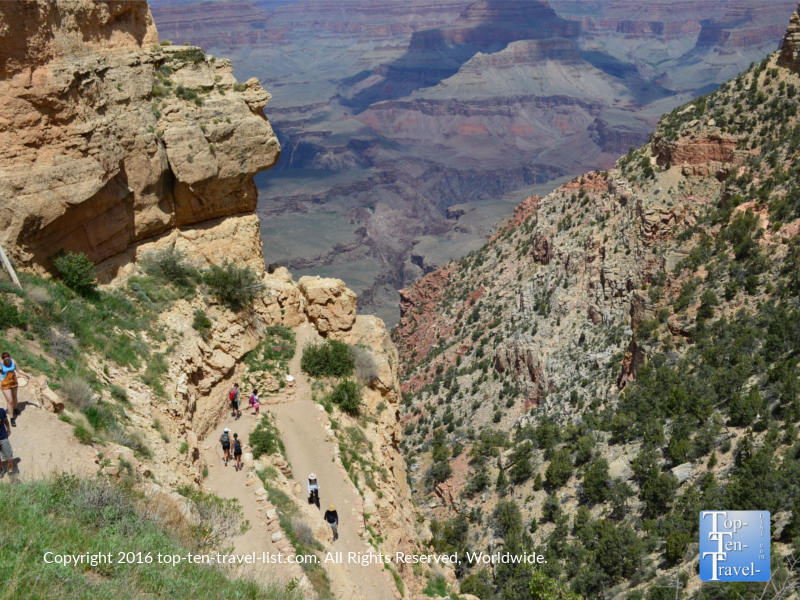 The temps will be cooler, there will be less people on the trail, the line to get in will be shorter, and finding parking at the Canyon will be a much smoother, less time consuming experience (especially true during the busy summer months). *In higher altitudes areas, you should be snacking more and drinking plenty of extra water. Wear a hydration backpack (fill up at a spring water station located at various points throughout the park including the start of the Kalibab trail) and load up your pack with lots of electrolyte and salty snacks to balance your water intake. Eat a full breakfast before your hike and eat lunch afterwards to refuel your body with lost minerals. Note: there is no water along the trail, so fill up before you begin! *Wear appropriate hiking attire, including quality hiking shoes. Dress in layers. *Carry a hiking stick for extra balance. This will help you with some of the steeper downhill portions as you go over loose slippery gravel. *Apply plenty of sunscreen even on overcast days as the sun is much more intense at this elevation (7000 ft) and the possibility of getting burnt exists even on the cloudiest of days. *Keep your backpack as light as possible as the extra weight will leave you with sore shoulders and an aching back the next day! 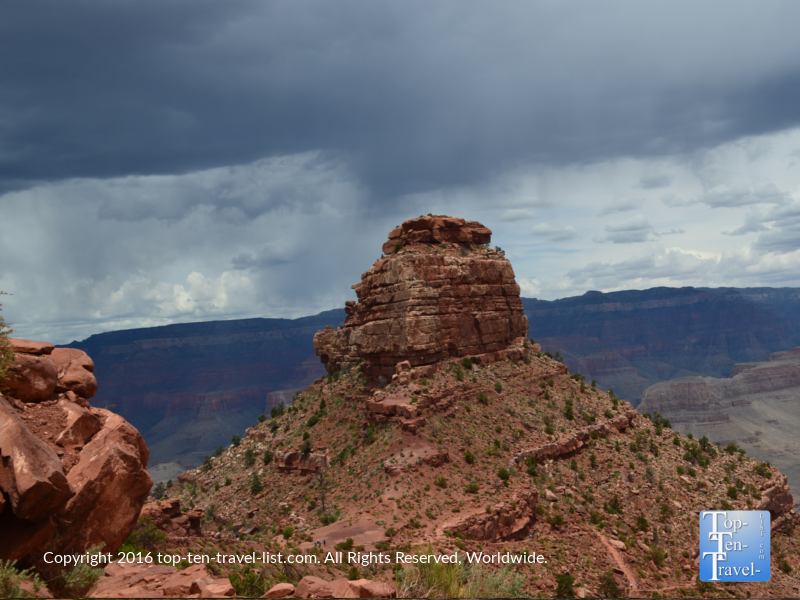 *Check the forecast during summer monsoon seasons (Northern Arizona has some of the highest lighting related deaths and injuries in the country) and plan your trip for another day if possible. If you decide to head out, stuff a light rain jacket into your backpack just to be on the safe side. *Be aware that weather can change very quickly during the stormy summer season. Also be aware that sudden weather changes are much more likely in high elevation areas. The day we visited we got a massive afternoon storm, despite the fact that the forecast showed very little chance of precipitation. *Remember that this trail offers virtually no shade, so a hat and/or sunglasses would be a smart idea. 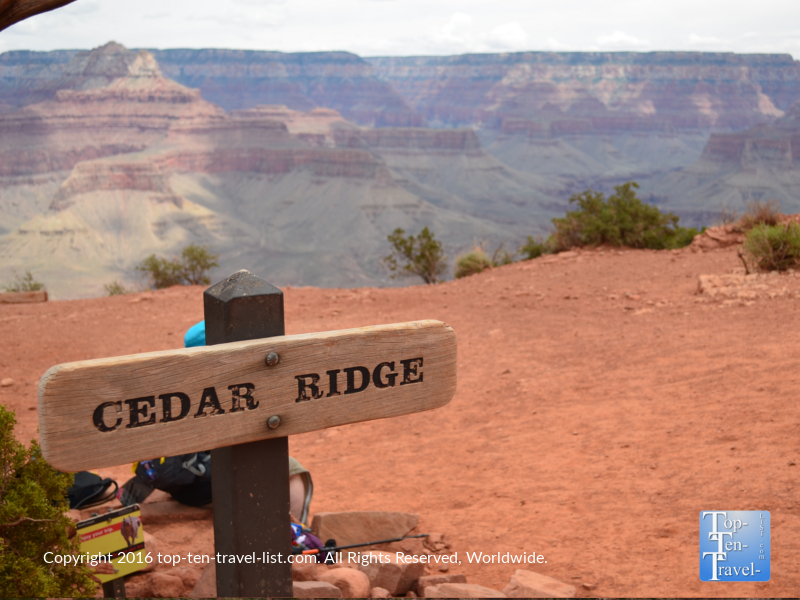 *It is recommended not to go past Cedar Ridge during the summer months due to the intense heat, dry air, little shade, and increased risks of dehydration. Save this hike for the cooler spring or fall season. *Most importantly, do not venture out any further than your ability level permits as the the hike appears easier when going downhill. The trek to Skeleton Point is well-maintained and easy to follow, yet very steep and only for those in the best of cardio shape. Also be aware that hot sunny days with temps often into the high 90’s+ make for one miserable hike. On a cloudy, 70 degree day, we were still overheated. The sun itself makes the hike feel much more difficult, especially when climbing uphill. If possible, plan your hike during the cooler spring or fall seasons and check the forecast for an overcast day. 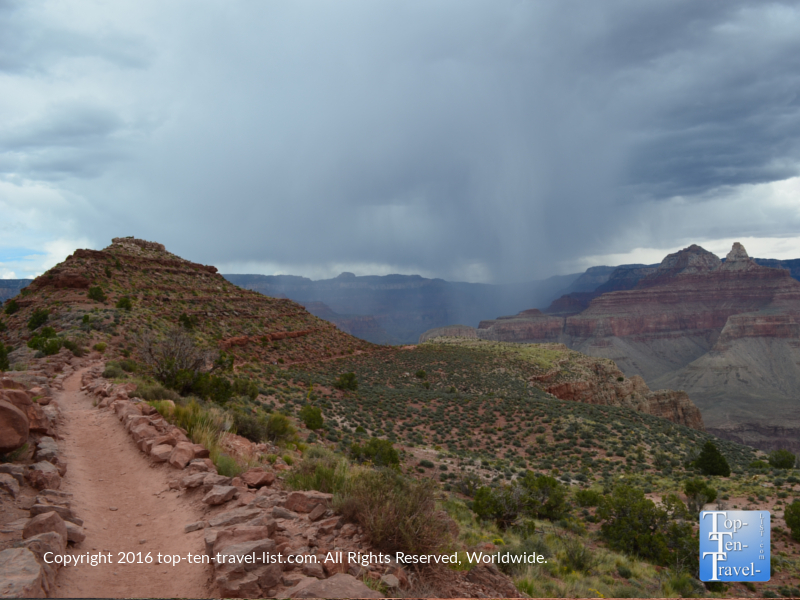 You must take a shuttle bus to Yaki Point to start the trail. 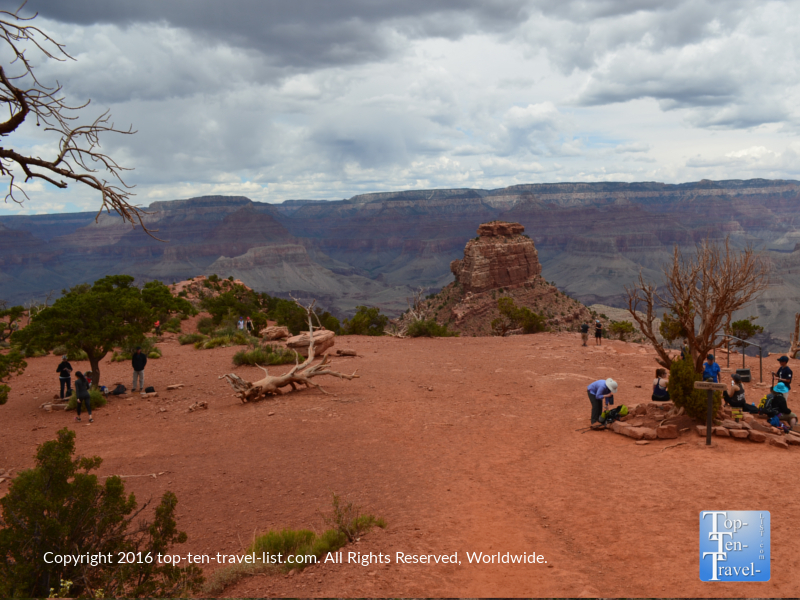 You can access the shuttle from various locations along the Rim Trail. I recommend parking at the visitor’s center and taking the shuttle from here. 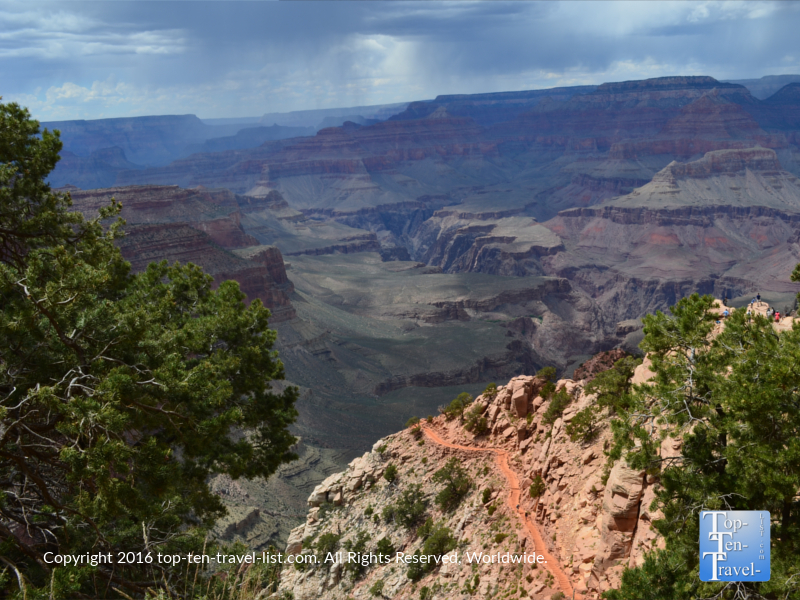 The Grand Canyon Shuttle service is a free & convenient means to get around the park, and is included with your admission price. 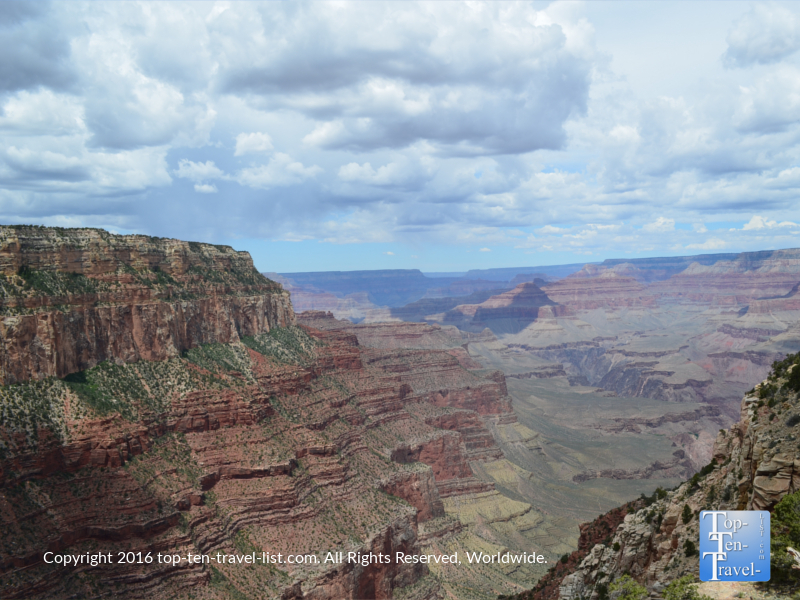 Fees are $30 per vehicle, good for both the North and South Rim for 7 days. I recommend an Annual Pass ($80), which easily pays for itself if you intend on visiting other national parks within a year time frame. 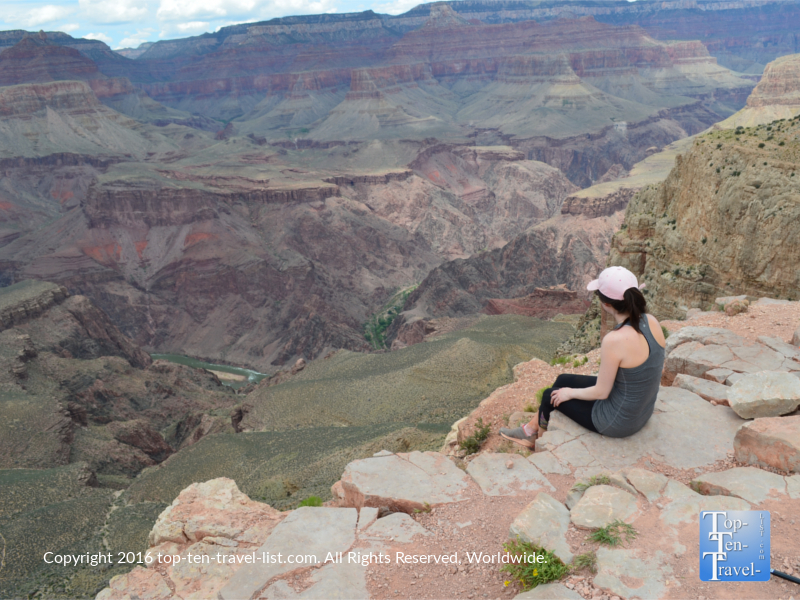 Staying at the Grand Canyon is the most convenient option, especially if you are hiking. This will enable you to get up earlier for your hike before the afternoon sun and crowds, not to mention avoid a lengthy morning drive before venturing out on a long, tiresome hike. There are 5 choices within the park, although they often sell out months in advance (especially during the summer season), so book your hotel as far in advance as possible. Other nearby towns with lodging include Tusayan (just one mile from the canyon with free shuttle service), Williams (about an hour’s drive and home to the Grand Canyon Railway), and Flagstaff (1.5 hour drive). Flagstaff is a popular destination due to the variety of restaurants and attractions found within town, however, you must be prepared for a lengthy drive in the morning.